Edible markers can be great tools to create very detailed designs for your cakes, cupcakes, and cookies. They come in many different brands and an assortment of pretty colors. They can be used on fondant, gum paste, royal icing (flooded and dry), marshmallows, sugar sheets, rice paper and icings that have set hard. Edible markers are user-friendly enough to be used by kids with little mess and fuss as long as you don't press too hard on them. You can make these tools a wonderful fun part of a birthday party as an activity. Simply bake and flood cookies with royal icing the day before and let the kids loose with a handful of festive colors. If you are a talented artist in pencils or inks you can draw spectacular detailed designs and pictures on your cake designs. You can even copy famous paintings or do realistic portraits if your surface is firm enough, the tip of the marker is fine enough and your hand is steady. You can even make lovely detailed sheets of music for the special music lovers in your life by carefully drawing the lines and notes on rolled out fondant. There is no limit to what you can do with patience and planning. 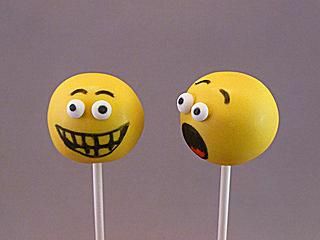 Do not use some products on candy melts, soft icing or fondant or waxy chocolate because they will not draw smoothly or even produce color at all. Trial and error will show you which brands will still work, such as Americolor Gourmet Writers. It is always important to let your surface dry somewhat before using the edible markers on it for the best results. Otherwise, the ink may smear, stop flowing or you might end up with color splotches imprinted deeply in soft fondant. You need to let your edible marker colors set as well if you are using different colors together on one section or they might bleed in an unattractive manner. Most edible markers do not layer well because the bottom layer tends to show through so if you are trying to produce a particular color by layering, such as purple from blue and red, it will usually not work. A better plan is to buy the color you need. Wilton FoodWriter™: This is a well-known cake decorating brand that carries sets of edible markers in sets such as primary colors, neon colors, and fine tip. These are good all-purpose markers if you don't need really fine lines but can be challenging on waxy surfaces such as candy melts or chocolate. Sugarflair Food Colouring PensThis brand has a lovely selection of shades and can be purchased as single pens so you aren't stuck with colors you don't need for your projects. They have nice fine tips and can be purchased on the cake decorating website. AmeriColor: These come in sets of ten which flow nicely and create lovely fine details and cover well depending on your needs. They are nut free as well as kosher and can be found online on many sites. FooDoodler: These are the choice if you want very fine lines for your cake and cookie decorating projects. They are also available in a thicker marker if coverage is the goal. You can purchase these markers on the FooDoodler website and other online cake decorating sources. These edible markers are nut free, kosher, gluten-free and fat-free. KopyKake pens: This edible marker product has two ends for convenient fine and thick lines, depending on your preference. They have nice color shades including two greens and can be found at the Kopykake website as well as other online sources such as Golda's kitchen.